With the aid of our innovative facilities, we are dedicatedly affianced in providing an exceptional quality collection of Steam Rooms which can be availed in different specifications. 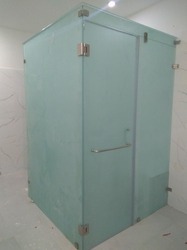 NOOR STEAM CABIN Size: 1200 x 1200, Right Version-multisite Function Manual Control Bath Wall Mounted Column From Supporting, Thermostatic Mixer And Diverter Hand shower With Is flex Flexible Hose And Aroma Dispenser Chromo therapy, stainless steel Overhead Shower. 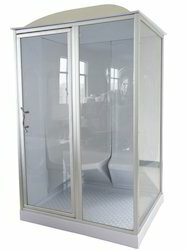 Reckoned in the industry as a prominent organization, we are offering Steam Shower Bathroom to our customers. These bathrooms are developed using quality-assured materials by our team of professionals. We are instrumental in manufacturing an extensive range of Multi Function Cubicles, which comes with multiple body soothers. These are easy to use and equipped with massage jets, and steam generators. Moreover, these are also provided with FM/CD players to make bath more enjoyable.